I'm soooo happy to bring this post to you all. It's taken me a good amount of time to really test this product out and be able to sit down to write an honest review about it. Miibox reached out to be a while ago and asked if I wanted to try out some products for review as a collab opportunity, and this was the first product that I picked out. It's been such a treat to use this! SU:M37° has always been a luxury Korean brand that I've wanted to try since they pride themselves on using natural fermented ingredients. SU:M37, owned by LG (yes, who make the phones), was established in 2007 and is free of fragrances, artificial colors, and synthetic preservatives. What exactly does "SU:M37°/숨37°" mean? "SU:M/숨" means 'breath' in Korean and "37°" represents the perfect temperature of fermentation. 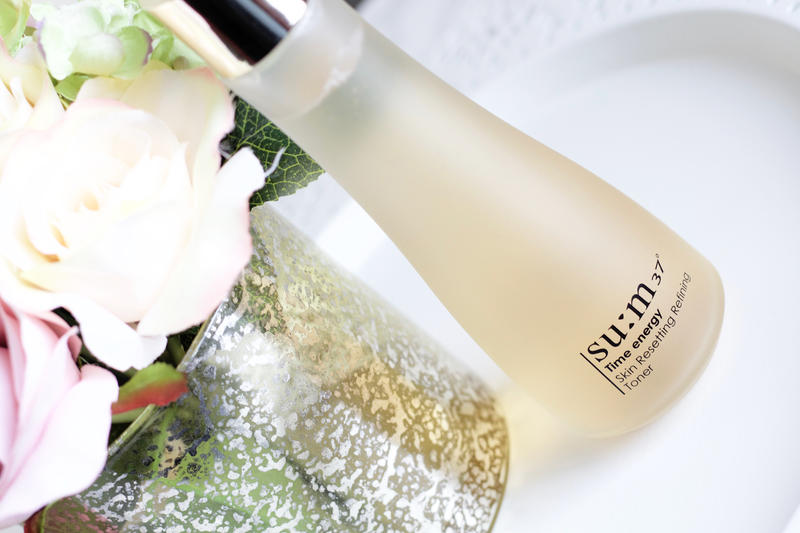 SU:M37 puts a lot of importance on "original beauty" and they go through a very diligent process for acquiring the ingredients needed for their fermentation process. They mention that they use "86 kinds of seasonal plants" per season, using all sorts of their physical makeup (branches, roots, stems, seeds, flowers, fruit, etc), and end up choosing the best to be part of their fermentation process. Supposedly the location where they do all their fermentation is based at South Korea's one and only exclusive fermentation institute (which I unsuccessfully have not been able to find information about). They remark that they put a lot of effort into studying and doing their own research on numerous kinds of plants to truly be able to get the best natural and fresh ingredients. You might have heard the term 'fermented' before from Japanese skincare brand SK-II, as they use a naturally fermented 'miracle ingredient' from yeast called Pitera (here's a great post explaining). Not only SK-II, but many other brands as well incorporate/base it around their whole line, like Missha, Sulwhasoo, Whamisa, and so on (not including Western brands as well etc). If you don't know what exactly fermentation is, it is a naturally occurring process by which yeast/carbohydrate produced enzymes work to break down large organic compounds into antioxidants, vitamins, amino acids, and rich probiotics (aka the 'good' bacteria). It is therefore making those important substances more available to use and absorb. SU:M37 describes it as being a biological process "where enzymes of microorganisms are used to produce, distribute, convert, and switch ingredients for human beings and ferment plants with microorganisms... to enhance the value of utility of our skin." All in all, very good things. The reason being is that these ingredients are power houses for taking care of our skin: amino acids (ex. encourages production of collagen for anti-aging), antioxdiants (ex. fights free radicals), vitamins (ex. vitamin b12, extracted from saccharomyes, helps treat hyper pigmentation and rosacea/dry skin), and probiotics (ex. research case studied to show its help with acne). In regards to fermented skincare and its process, the ingredients (ranging from floral/herbal/food ex. rice/many different things, etc) are soaked in some kind of enclosed space and will sit for a considerable amount of time until they are fully ready. It occurs in an aerobic setting (no oxygen) and takes some patience since it is something that doesn't happen overnight. SU:M37 says that they ferment their ingredients in an "oak tank, cedar tank, and a pottery tank" to benefit the process of each one individually. After the fermentation rounds, combination of "the technology of SU:M37," and a wait period of "four seasons," they will then filtrate out everything except what they deem important to being good and healthy for the skin. Since Korean skincare uses a good amount of food-based ingredients anyway, they go through an organic fermented process regardless. There are research backed studies that provide ample evidence of the efficiency that fermented skincare has for being topically applied, along with fermentation of plants, so there's actually science behind all of this and it's not some gimmick that's being hyped all over. The lovely Renee has a great video explaining the concept (blog post too!) and also mentions her favorite fermented skincare she uses. 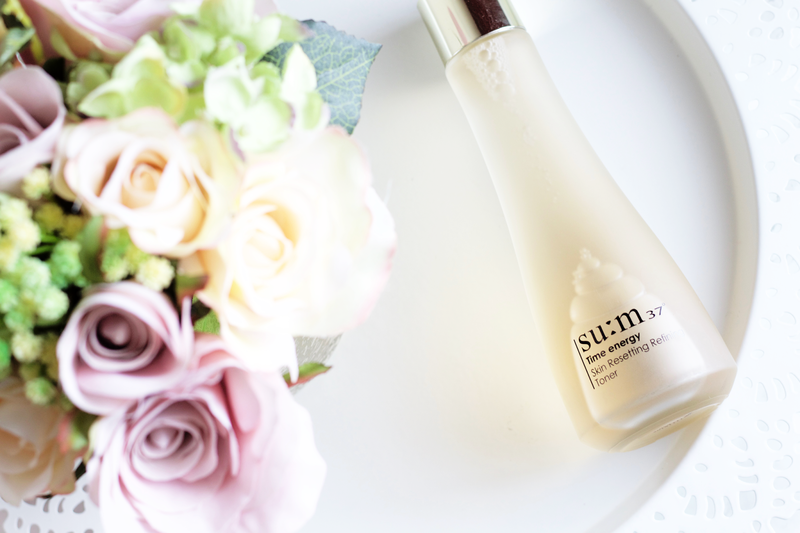 SU:M37 has fourteen different skincare lines, each with specific target treatments. They not only have skincare products available to purchase but also makeup, too. 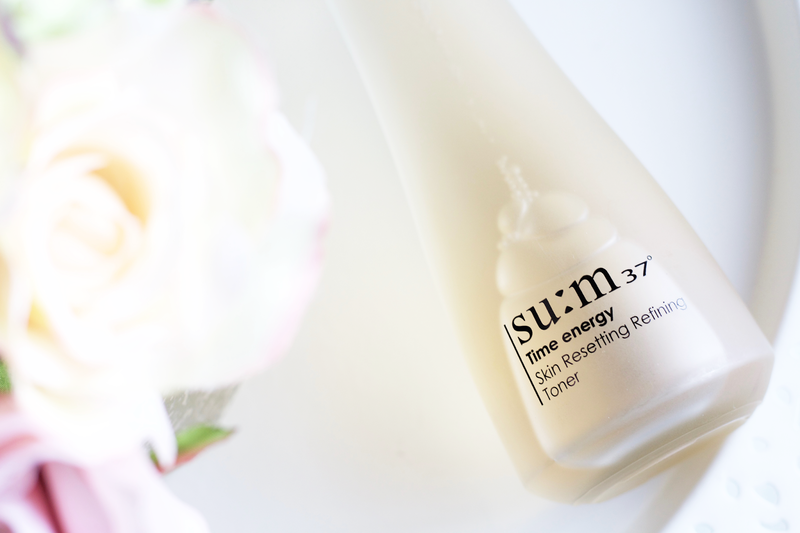 SU:M37 Time Energy Skin Resetting Refining Toner* is part of their Time Energy line, which is targeted for oily/combo types who are prone to sensitivity and have often troubled skin. They describe it as a line that "recovers the exhausted skin by normalizing the disturbed rhythm... by using the fermented material, which has the vitality of life from long waiting," basically a whole line that works to revitalize and treat skin that needs it the most. There are four products within the line: Skin Resetting Repair Serum (energizes the skin and keeps it pure and healthy), Skin Resetting Moist Firming Cream (strengthens the foundation of skin and keeps it hydrated), Skin Resetting Softening Emulsion (balances oil and water, and keeps skin moist and smooth), and Skin Resetting Refining Toner. As you can see, there is a lot of 'resetting' happening. The whole concept is that it 'resets' your face, by lessening/balancing your facial oils and helping nourish sensitive skins. 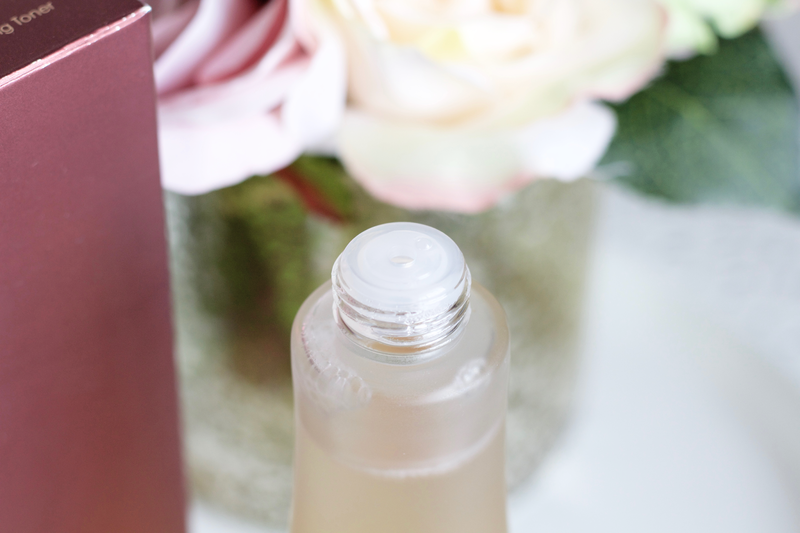 This toner specifically helps to keep "the skin supple" and "smooth out skin surface" by the abundant natural fermented ingredients and plant extracts (which you'll see all the ingredients lower in the post). The consistency of the toner is very thin and watery, smells very fruity! Every single time I would use this I would loooove to just smell it straight from its bottle. It says to apply it using a cotton pad and pat after, but I found I was wasting a lot of product doing it that way. The open part of the top only lets out so much product and you really have to just shake it out quite strong (at least I did), and I was wasting some product since I didn't need a whole lot of it. The best way for me was to just put it straight onto clean hands and pat it into my skin. I found that it gave me so much more hydration compared to when I tried to use it with a cotton pad. I loved how cool the product was on my skin and how watery it felt, especially as its been so humid here, it was like my skin was drinking it all up right as I placed it on! Plus with all my pigmentation and troublesome spots, I really felt like having it directly put onto them (with no added texture like a cotton pad to scratch against or dilute the liquid) helped a lot with lowering the redness and getting the most out of the yummy, skin nourishing ingredients. I used this successfully over a 3-4 week period on a daily basis, using both evening and morning time, and from that concentrated usage I felt my skin look clearer and softer. My oils felt a lot less than usual and I really do believe it's because it was lacking the needed amount of water content in my skin, so this toner really helped to treat that. Around the same time as I began using this, I also began to incorporate more moisturizing oils and lotions. So, using this as the basis starting product with all those really helped my skin to get to where it is now. The packaging is just beautiful. Etched on the front of the frosted glass bottle is the black lettering titling the product, and in the back has all the information in Korean. I love how luxurious it feels and looks. The gold top with the SU:M37 logo is beautifully engraved into it, it really adds such a lovely touch to the product. It's the little things that make this brand so special. It is on the heavy side, so maybe not the best when traveling (but easily decanted into a smaller container). I love that it is a frosted glass bottle, protecting the ingredients from any possible light inducing harm to lessen their quality and performance (you should keep this in a protected place, regardless). One thing I want to bright attention to is Korean expiration dates and how to read them, as the location of it is on the bottom of the bottle (mine says 20181111까지). Sometimes you'll see two dates, one manufactured date and one expiration date, and others one date (like mine). If you're newly getting into Kbeauty, it's good to recognize these Korean characters and understand what they mean so you're not totally confused (or end up throwing away products that are not expired yet!). Seeing as I don't understand Korean, I can't translate the ingredients into English myself. Luckily some have already done so, and I'd like to give them credit by showing you where to read the full English translated ingredients. Translators put a lot of time and work into their craft, so they deserve the respect and full credit from that hard work. You can also see the ingredient list available on cosDNA. Now, how do your eyes feel after reading ALL of those ingredients? 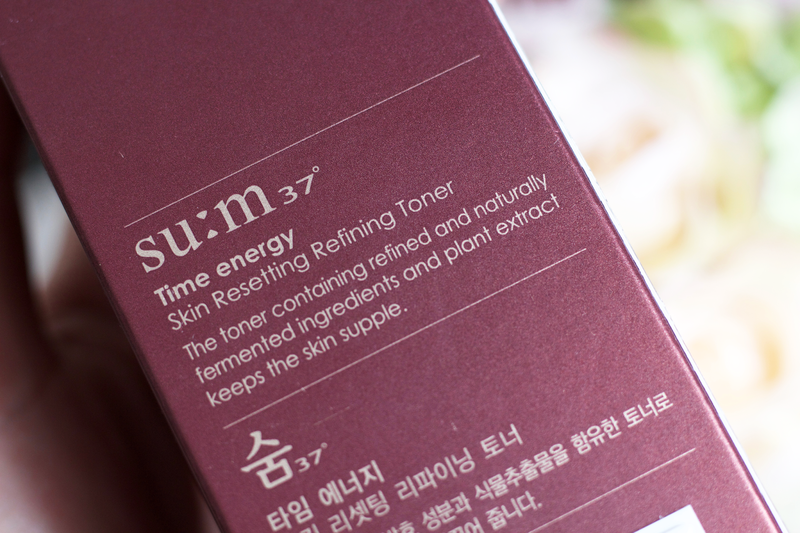 SU:M37 isn't messing around when they say they use 86 kinds of seasonal plant extracts. In the actual large chunk of the ingredients, Saccharomyces and Zygosaccharomyces from yeast and multiple gram-positive lactic-acid bacteria (plus other kinds of different sourced bacteria) from carbohydrates (Lactobacillus, Leuconostocare, Pediococcus, and Polysaccharide Maltodextrin) are both found in this product. The first chunk of fermented ingredients, Lactobacillus/Ampelocissus Martini Fruit/Lavender Flower/Rosa Canina Fruit/Rosemary Leaf/Sage leaf/Thyme Leaf Extract Ferment Filtrate, is unique to the Time Energy line. Whereas the larger chunk of fermented ingredients, starting directly from 'Acetobacter/Aspergillus/...' all the way until '.../Potato Fermentation Extract (aka Helianthus Tuberosus Tuber Ferment Extract),' is SU:M37's specialized mass fermentation juice. It's basically a huge chunk of fermented plants, foods, yeast (filtrated), and carbohydrate produced results all mixed together. There is no added fragrance, however natural essential oils such as Lime Oil, Rosemary Leaf Oil, and Grape Leaf Oil are used (unsure if added for fragrance purposes, however!). Limonene is the last ingredient in the product and is a known naturally occurring fragrance used in cosmetics, so that is definitely being used for the fruity smell of the toner. There are a good amount of emulsifiers in the toner to help with moisturizing and helping to absorb in the skin. I found that while it was enough hydration and more for me, it might not be for those who have dry-very dry skin. You definitely will want to slather on a good moisturizer when you use this. Since it has ingredients that are good for helping acne and balancing oil (such as what I've listed below), the exfoliant properties might not be the the most moisturizing for dry-very dry skin types. Clarification: all of the pictures in this post have been taken a couple weeks ago. I usually take pictures of my products quite early in my usage for blog posts. I can't speak highly enough about this product. I'm dying to try more from SU:M37 and especially from their Time Energy line since it specifically is aimed for my skin type and concerns. Their Secret Essence and Repairing Serum are next on my list for sure. I also highly recommend Miibox (no, I am not obligated to say so as I truly believe this!). They are the loveliest and have a mass amount of Korean skincare available to buy, along with Japanese, etc, and makeup products, etc, too! It also helps they are located in Southern California as well like me, but ships very quickly to everywhere else even outside here. Have you tried anything from SU:M37°? What are your favorite fermented skincare products? *This product has been kindly PR gifted from Miibox. See my disclaimer for more information.